Coca Cola has enlisted two politicians for Jinx, a TV ad being aired at the Super Bowl 2008. 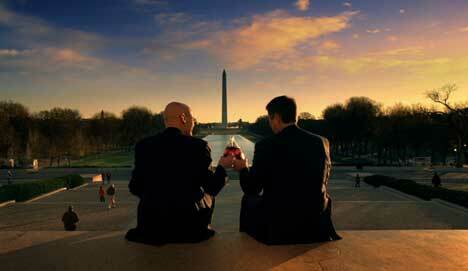 A Democrat and Republican snap out of their usual bantering to enjoy the sights of Washington D.C, fueled by nothing other than Coca Cola. Democrat political commentator James Carville and Republican former Senator Bill Frist argue with one another on a television news show. All of a sudden they find themselves saying together, “They’re just plain wrong.” Frist yells “Jinx” and demands that Carville buy him a coke. Carville and Frist are united by their enjoyment of the coke, so much so that they continue the experience with a sightseeing tour of Washington DC. The tour includes the Capitol Building, the Jefferson Memorial, a museum, a painting of George Washington, the White House, a Washington Wizards NBA game, the Lincoln Memorial, the Reflecting Pool and the Washington Monument. 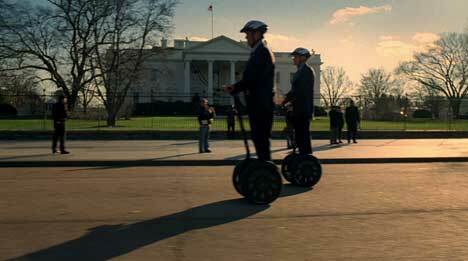 Classic scenes include the politicians riding on Segway Personal Transporters and posing for a caricature drawing. See Jinx online in Windows Media format at www.mycokerewards.com. The Jinx ad was developed at Wieden+Kennedy, Portland, by creative director Hal Curtis and Sheena Brady, copywriter Brian Murphy, art director Nate Miller, account manager Hanna Nesper Newell, and agency producer Hayley Goggin, executive creative director Jelly Helm, executive creative director Steve Luker, agency executive producer Ben Grylewicz and agency director of business affairs Amber Lavender. Filming was shot by director Paul Gay, via Hungry Man, with executive producer Dan Duffy, producer Elizabeth Amaral. Titles and graphics were developed by Kyle Valenta at Joint. Editor was Corky Devault. Post sound was produced at Lime Studios, Santa Monica, by Rohan Young. Effects were done at RIOT by artist Mark Dennison. Colorist was Dave Hussey at Company 3. The End Tag was developed at Brand New School. Music was produced at HUM Music by executive producer Debbi Landon, creative director Jeff Koz. Sound was designed and produced at 740 Sound Design by Scott Granary.